Worker bee by day.....runner, fiddler and 'jack-of-all-trades' artist by night, craving to learn all I can about whatever art form I'm obsessed with at the moment. I love landscape painting, making paper flowers and general crafting, though my interests tend to change with the wind. I'm known to browse Etsy, Hobby Lobby, and the arts/crafts/photography sections at B&N for hours looking for the perfect new project or three. Some say I have too much time on my hands. Others say I have too much going on in my life. I say bring it on! They’re finally finished! Took me long enough, right? 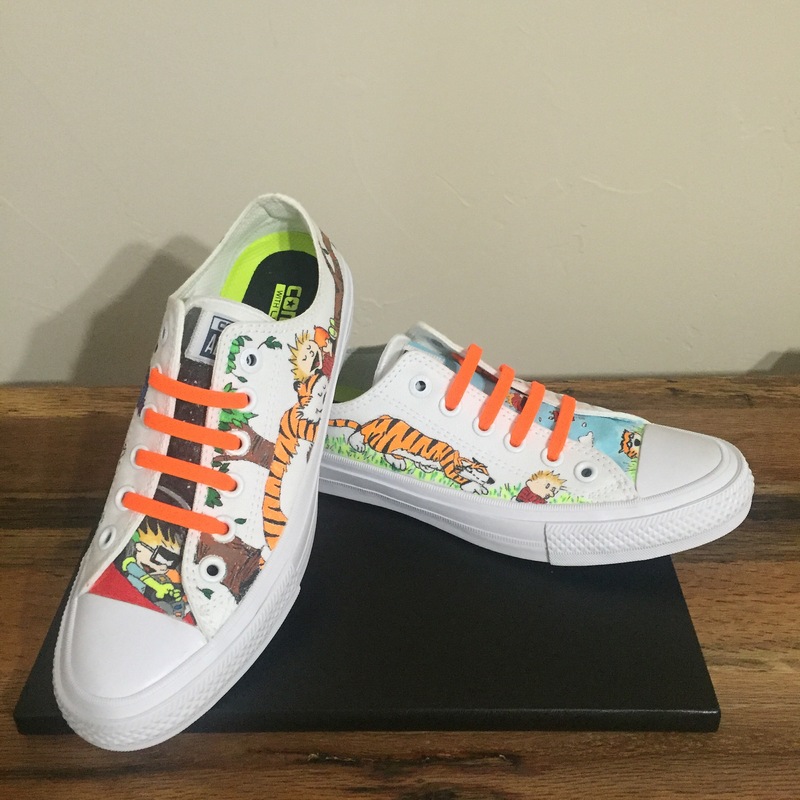 But I’m super stoked to show you my latest creation…drum roll please…..Calvin and Hobbes themed painted Converse’s! Calvin and Hobbes is my favorite comic of all time, so it’s only fitting that I used it as my inspiration for my first pair of painted canvas shoes. Check them out! I used fabric paint, fabric markers and paint markers for the design. Then I sealed the paint with some clear matte varnish. The markers were definitely the easiest to use, but I don’t think they would show up as well on shoes that aren’t white. I’d like to try my hand at a different color next time so I will definitely be practicing up on my fabric paint skills. The most difficult part of this project was finding designs that would fit on the quite narrow sides of these shoes. My new goal is to make a whole collection of different themed, different color, and different styles of Converse shoes. I need your help deciding what themes to paint next. Any ideas? Please leave me a comment! Mother’s Day is coming up fast and today I have for you a fast and easy way to dress up Mom’s card or gift. I use these little guys as gift toppers, slipping them right underneath the tied ribbon. Or make several and give Mom an everlasting bouquet to show her she is forever loved. These paper flowers aren’t the most realistic looking ones in my arsenal, but what they lack in realism, they make up for in charm and durability. The heavier paper means they won’t easily get wrinkled or ruined (unless you get them wet of course…..don’t water your paper flowers….they aren’t real). paper ribbon in black and either red, pink, white or yellow (also known as twisted paper). Easier right? No searching for heavy crepe, no online ordering (you can buy all these supplies at your local Hobby Lobby), no downloading templates, and best of all very little cutting. Ok well there is some cutting. But it’s sooooo much faster than cutting individual petals. Cut a 2 inch by 3 inch rectangle of your yellow tissue. Cut a 2.5 inch section of black paper ribbon and three 3-inch sections of your brightly colored paper ribbon. Use your wire cutters to cut a 6 inch section of wire (or longer if you are making several for a bouquet). Make the yellow center of your stamen. Crinkle up your piece of yellow tissue and fold in half over the tip of your wire. Tape in place with a small section of green floral tape, gently stretching the tape (to activate the adhesive) and wrapping it down the wire stem. Unfold your black paper, and cut in half with the grain. Now make 5 to 6 cuts about 3/4 of the length of your paper. Make sure and cut with the grain. Twist each piece of fringe. Cut a small to medium length of floral tape. Wrap your black fringe around the yellow center and wrap your tape around the base of black fringe and down the stem to secure. Take your brightly colored pieces, unfold them, and round out the edges. I like to round one side of each petal a little more than the other side for a more organic look. I attach each petal separately for this flower because the petals are thicker and it just seems easier. Cut 3 medium to large sections of tape (about 8 inches or so). Attach each petal by scrunching the base of the petal just a bit, holding in place around the stamen with one hand, and wrapping tape around the base of the petal and down the stem to secure. The petals will overlap each other some. With one last long piece of tape, wrap your stem one more time,slowly and carefully, for a finished look. Now for the overly ambitions ones out there, I like to make the stem a little thicker just like a real tulip by using a straw. Insert the bottom of your stem into a straw and position the straw so that it butts up against the thick base of the flower. Cut the bottom of your straw/wire to the desired length. Now wrap tape from the base of the flower over the straw and down to the bottom of the straw. If you cut a piece that is too short, no worries…..just cut another piece of tape and pick up right were you left off. Twist the tape at the bottom and wrap it back up the straw just a bit to round the bottom out. Where your tape ends, press in with your fingernail to keep it in place. Now shape your flower by gently stretching each petal at the middle so that the petals cup around each other. Straighten and shape the fringed stamen and viola! Super cute and bright….strong enough to handle some handling….simple enough to make in 20 minutes or less……and a fun way to brighten Mom’s day! Now run along and start creating! Don’t make me tell you twice! Happy Mother’s Day to all moms, mommies, mommas, mothers, and humoms. You are, after all, the reason we are here to live, love and create. Until next time, my flowered friends…..this is KristyMichele signing out. My current flower project is to recreate the budding branches of my forsythia….something tall and bright for an umbrella stand that sits in my entryway. As I create my ‘mini-trees’ I am reminded of these fabulous wire trees a friend of mine makes…..each branch is smaller in scale with thinner, more malleable wire but the technique is the same. As my mom and I worked together on this project, I found and worked out more than a few kinks in my original plan. These flowers may be a bit bigger than your standard forsythia but the bigger petals make them easier to handle and they still look cute. I also made my leaves with tissue paper at first to make obtaining your supplies easier, but they just didn’t look right. I ended up using crepe paper for the leaves, but cardstock or scrapbook paper may do in a pinch. And that my friends is why I’m here….to work my way through the mistakes so you don’t have to. green or lime green heavier crepe or craft paper. Mine is yellow-green gradient crepe from Castle in the air. yellow or green stamens. I found some lime green pips in Hobby Lobby’s cake decorating section that work especially well, but small yellow ones are cute too. floral wire….the cheaper kind that comes on spools, because we will be using a lot and we want a longer cut of wire than the precut pieces. my flower petal and leaves template. First off we want to create our branches. I created branches that are about 30 inches tall using various lengths of wire twisted together. Cut 4 to 6 sections of wire in various lengths, depending on how tall you want your arrangement. Hold the wires all together and start twisting them together from the bottom up to form your branch. Pull out wire in twos as you work your way up to resemble the smaller twigs coming out of the thicker branch. You can separate some of your wire pairs to make even smaller twigs. Wrap brown floral tape around your wire, working up from the larger stem and up into the smaller twigs. Stretch the tape slightly as you go to activate the adhesive. Cover the whole branch with brown tape. The following video will hopefully give you a clearer picture of how I twist and wrap my wire (as well as adding the flowers later). Now we need to make our flowers and leaves for the top. 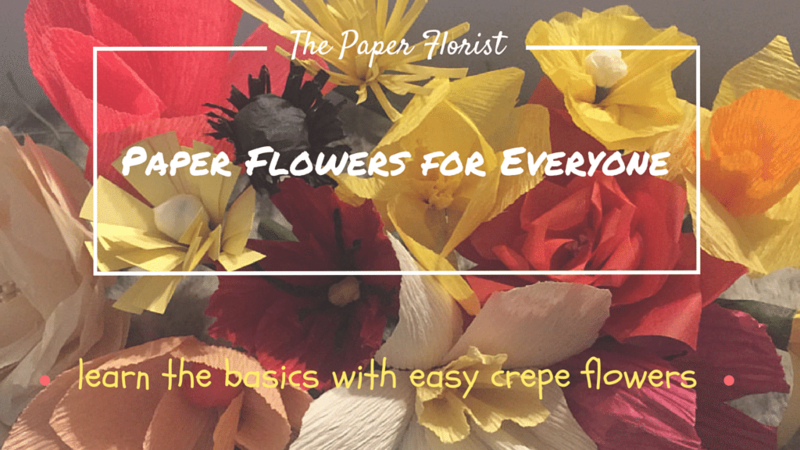 Cut petals in yellow tissue paper and leaves in craft paper or crepe, long side with the grain. You will need 8 petals and 1 pip for each flower. I used my larger leaves by themselves and the smaller leaves attached together in pairs. The flowers will the bulk of the color in our arrangement so cut enough to make several flowers. Layer and shape your petals. Make 4 petals by layering them in pairs. Twist each pair together at the base while folding inward so they look a bit like a spoon. Fold one pip in half and attach to a 1.5 inch section of wire by wrapping a small section of green floral tape around it. Now position 4 petals around the pip center and attach with another section of green floral tape. You don’t have to cover the entire section of wire with green tape because we will attach these to your branch with brown tape later. If you need help with your flower-making and wire wrapping technique, watch my YouTube video on my previous flower post, Paper daffodils. I think it looks cute to attach the smaller leaves in pairs. If using crepe paper, scrunch the bases and attach to a 1.5 inch section of wire (using green tape) with their colorful sides facing each other. Gently stretch the middle of the leaves so they cup towards each other. The larger leaves can be stretched slightly, scrunched at the base and simply attached straight to a branch by themselves with brown tape. Attach flowers and leaves in various positions around your branch. To attach, hold the flower where you want it with one hand and leaving a little of the green tape showing at its base, wrap a small section (about 2 inches) of brown tape downwards until you have attached the entire small piece to your branch. To keep your tape from coming undone at the bottom, use your fingernail to make a small crease where you stopped. When you have all your flowers and leaves attached where you want them, gently shape your arrangement, and display! You may want to make a few branches (as I have done) for a greater visual impact. And isn’t that the truth…. I really love this quote. It reminds me it’s okay to make mistakes, to relax a little and give myself a break every now and then. After all, I am not and never will be perfect. Speaking of which, I have a confession to make. I did not meet my goal of writing 8 blog posts in the month of March nor did I finish my big grand finale project for March….my custom painted Converse sneakers. I find that perhaps….just maybe….my goal of posting twice a week may have been a bit unrealistic with my busy schedule. (Classic case of life gets in the way.) As far as the shoes are concerned, I have an idea, a plan, the supplies, and some sketching practice under my belt…..but let me tell you something, artists. It is difficult and nerve-wracking to take a brand new $50 pair of shoes and draw all over them. What if I ruin a perfectly good pair of sneaks?! Not to mention I bought white so that the paint shows up better…..which ironically will allow any mistakes to show up better too! In any case, the project will continue, and become my big project for April instead. For now and until I build up the practice and confidence to deface my shoes, here’s a look into my inspiration for the design….. Growing up, I was obsessed with Calvin and Hobbes….everyone’s favorite child/stuffed tiger duo. I had every single Calvin and Hobbes comic book. A couple weeks ago I reread them all, looking for the exact images I wanted….and sketching them in my sketchbook for practice. All I can say is Bill Watterson is a genius, and I will never do him justice….but I will come as close as I can. I suppose now you’re probably wondering what is in store for us this month. 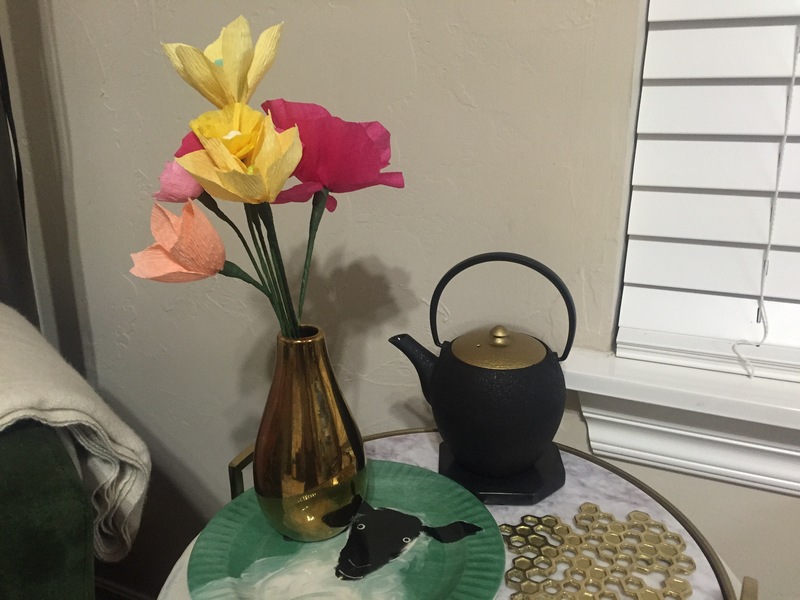 I have been busy dissecting blooms off my forsythia bush for this month’s flower project…..forsythia branches…..nice and tall to fill an umbrella stand turned vase in my entryway. Where will you display yours? I must be on a yellow theme or something, yes?…..daffodils last month, forsythia this month….I do love yellow. Since I already have a head start and my forsythia is actually not in bloom anymore, we will mix things up and create these early in the month. As far as our sketchbooks are concerned, why don’t we take our art kit outside while the weather is nice and sketch some nature while soaking up some sunshine? I am attending a sketch crawl (ackkk!…super excited) next weekend at our local botanical gardens, so I should have lots of sketches and outside painting tips to share. And then if I get bored, I will play with ideas on creating a comic strip of my own or maybe a zine. Zines…mini magazines…I’m not completely clear on what they are…but they’re big in Europe and I want to make one filled with artwork! I will probably also start another semester of Sketchbook Skool. I tried to talk myself out of it….but I really love love love Sketchbook Skool! I think I might miss it terribly if I don’t keep with it. Well, I think that’s it for now, artists….have I bombarded you with enough plans? I say we stop talking about them and start working on them! Until later, this is KristyMichele, signing out…. Welcome back, paper artists…..to part 2 of Paper Daffodils! Easter Sunday is coming up fast. Do you need decorating ideas? If so, you’re in luck because today we learn how to make a small daffodil centerpiece……or large one if you’re feeling really ambitious. It’s a pretty simple process once you have your flowers all made and really makes the flowers look real. a bowl or short vase, preferably opaque, to hide the floral foam we will be using. One with a wider opening will be best for this project. I am using a vase that is 5 inches in diameter and almost 5 inches tall. paper daffodils. My previous post has all you need to know to create these. You’ll need probably 5 or more depending on how large your container is. floral foam to fit in the bottom of your container….found in the floral department of Hobby Lobby. If it is too tall like mine is, you can cut it with a hacksaw to fit. dried moss….once again found in the floral section of Hobby Lobby. *side note*–I did not use anything this time to adhese my floral foam to the container. I just tried to balance the flowers and leaves well on the foam and stuffed in enough moss to keep it from slipping to one side. In retrospect, it would have probably been easier to build if I had used some adhesive dots, putty or floral clay. If you choose to try this, just make sure that what you use is removeable so that you can reuse your container later. Let’s make a space for your flowers to sit. Select your bowl or vase. Trim your foam to fit inside. You are going to add a layer of moss, so you want the top of the foam at least 1/2 to 1 inch below the edge of the vase or bowl. Insert the foam into the container. If you bought removeable adhesive, first clean the bottom of the container with alcohol, then place the adhesive, then attach the foam. To form the leave, place a piece of floral wire down the center of one of the leaf sides. You want your wire to stick out of the leaf at the bottom enough to stick into your piece of foam. I placed my wire so that it would stick out about 2 inches out of the leaf and run up about 3/4 the length of the leaf like so: Glue the wire onto the leaf side, then place the matching leaf side on top and press firmly. Since I used a hot glue gun, I placed a dot of glue at the bottom, about every 3 inches, at the top of the wire, then again at the top of the leaf. Ok, now the fun begins! Decide how you want your flowers arranged, and begin inserting each flower into the foam. Now fill in the empty spaces in the middle with your leaves. Gently pick apart your moss and use it to cover the foam and you’re done! Just in time for an Easter dinner centerpiece. If you got busy and just made a few flowers, you can always stick them in a bud vase, use them as gift toppers, or tie one to the handle of an Easter basket. Got more ideas? Share them in the comment section! Until next time, my paper crafting ‘peeps’, have an awesome Easter and see ya soon….this is KristyMichele, signing out.